The only thing better than having a cat is having more than one! They can give us ENDLESS hours of entertainment, fun and enjoyment. On the flip side, of course, is endless hours of cleaning up after them, the least favorite chore of course being cleaning the litter box. Traditional litter boxes and litter can leave your home smelling less than desirable – if you’re wondering why you haven’t had any guests pop over for a while the answer may lie in the litter box. If you don’t have the budget for an automatic litter box, but you still want your ﻿﻿house ﻿﻿smelling fresh all day every day, we’ve come up with 5 of the most popular brands available today. **Below, you'll find more detailed review, but you can also click links above to see current prices and read customer's reviews on Amazon. Should You Get More Than One Box Per Cat? If you have an older cat who has been using a certain litter system and you’re going to change it, you may be met with some resistance. Like humans, cats are a creature of habit and will not appreciate being ‘told’ to do their business somewhere else. To get around this, place the new box in front of the old one and allow your cat to get used to it; stop changing the litter in the old box. Cats HATE dirty litter boxes, so once they see that it’s full they will start to use the new box. If they do their business elsewhere in the house, then remove the new box, change the old litter and try again in a week or so. Eventually, they will learn to use the new box. OK, the whole point of getting a cat box for multiple cats is that you can get by with just one, right? Well, sort of. If you have two average size cats, one box may do; however, if your cats are ‘full figured’, or you have more than two, consider investing in more than one cat litter system. Place them side by side so each cat can choose which one they want. If you purchase a quality litter box system, you’ll find that cleaning two is not that much more work than cleaning one. If you invest in a system that reduces odors you will only have to clean it once a week, depending on how many cats use the box. The alternative is to give your other cats away – as if that was an option! To have a cat is to love them for a lifetime. While these litter boxes make clean up fairly simple, there are some ways you can make clean up even easier. Make sure you use the liners that are recommended with the box you buy; if you want to save some money, you can use garbage bags to line the box. Place a mat on the outside of your box; when your cat jumps out of the box and onto the mat, any litter that lingers on their paws will fall out on the mat. This will help keep the rest of your home clean and contain the mess within the area of the litter box. Make sure you buy litter that is dust-free. Most of the litter boxes we’ve recommended use quality litter or pellets; but it’s always a good idea to use clumping litter that minimizes odor and mess. Whether you have one box, two, or five, set a regular schedule to clean the litter box(s) so that your home stays clean and fresh. When you have more than one cat, litter is NOT the only thing you have to constantly clean. Between cat hair, cat toys, scratching posts, play centers and food dishes, it can seem that all of your household chores center around your furry friends! Keep these organized by having them in a specific corner in the room. Place the toys in a bin and only have one or two out at a time. If your cats are like mine, they love to push their toys under the couch and into ANY crevice they can find. Create a schedule to dig them out and place in the bin. Invest in a hand-held vacuum specifically formulated to pick up cat hair. You may not mind sitting in a chair covered with cat hair, but your guests might! Also invest in a good quality vacuum that will pick up stray litter around the litter box. Of course, if you invest in a good litter box, there won’t be a lot to pick up thank goodness! Fits your budget: Of course, it should fit your budget; this is especially important if you intend on buying more than one. Side entry: Top entries may be okay for young, active cats, but once your cat reaches its senior years, he may have a hard time jumping up top to enter the litter box; and you definitely don’t want to make it hard for them to do their business – otherwise they may find another place in your home that’s more convenient. If you want great odor control and a complete start-up kit, this is an ideal option. The package contains a litter box, a scoop, a bag of pellets and 4 pads. It is very simple to set up and your cats will get used to it easily enough. The disposable pads that are included with the kit last for one month for quick and easy cleanup. If you’re short on space, this corner unit space saving system can be an ideal solution. The advanced plastic technology allows for superior odor control. The plastic material actually guards against and blocks bacterial odors from being absorbed into the plastic. This is one of the most popular choices for those who are concerned about odor. This extra-large enclosed cat litter pan ensures that even your full-figured cats can get in and out easily. The replaceable Zeolite air filter and odor door virtually eliminate odor, reducing the need for air fresheners in your home. The unit measures 21.5" x 17.5" x 18”. This system is a bit on the pricier side of the scale, but is ideal if you live in an apartment and have multiple cats in your home. The box can hold two small cats simultaneously, although most cats give each other the courtesy of privacy. If your cats like to do their business together, however, they could have a synchronized poop fest. The high back and lid helps to reduce litter spillover and tracking. Measures 24.8”L x 20”W x 16.5”H. The door opening size is 8.2” x 7.12”. Favorite is a quality brand that devotes itself to providing the very best in pet supplies and accessories. They understand how important pets are to families. This cat litter box features an enclosed system that cuts down on odor and mess. The enclosed system also allows for privacy, while holding the litter inside and containing odor. Exterior size measures 25” L x 19” W x 16.5” H.
So is there a clear winner here? While they all possess many pros, we like the Petphabet Jumbo Hooded Cat Litter Box the best. It seems to offer the best value for your money. It will suit multiple cats and the lid ensures that mess and odor are kept to a minimum. The side entry makes it easy for young and senior cats alike to jump in and out with ease. 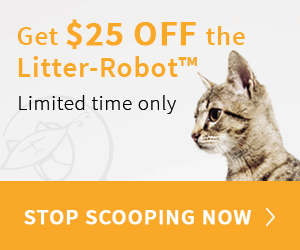 While it’s on the more expensive end of this category of litter boxes, we think it’s well worth the price. Easy clean up, easy maintenance and no expensive refills to buy! That sounds good to us! What about you? Do you have more than one cat in your household? How do you deal with the odor and mess? We’d love to hear your thoughts! The Best Cat Dewormer to Remove All Worms from Your Feline Friend’s Life Forever!